I am a super duper soccer fan! So it is without saying that I was gripped to my TV set with game after game of the World Cup. I was totally bummed when Brazil lost that game versus the Neatherlands. My hopes for a Brazil vs Spain final was crashed, but you cannot say how incredibly happy I was when the Spanish team won, very deservedly so with one of my favorite (if not up high as the best) game in my soccer-tv viewing-life! An incredible chance has come to visit Spain, we had a call from our friend Martin that lives in Madrid and Paulina who lives in Barcelona. Both are so into soccer and its funny cause they do the pilgrimage to either city to see the best show that any football (as they called soccer in Spain) aficionado can see, the yearly battle between Real Madrid and FC Barcelona. It is like the Celtics-Lakers or the Yankees-Red Sox of soccer, it is that good! We got into the airplane in JFK airport New York at 7:50pm Friday and arrived in Barajas Airport in Madrid at 9:40am Saturday. Which was great cause we all slept thru the trip and woke up when we were reaching Madrid. The gang went to the Budget Rent-a-Car desk to pick up our car, an Audi A3 4-doors. At a cost of $506.90 doesn’t seem bad, specially since we were going to Spain which we heard that any country in Europe is a bit expensive. We scratched the first day to get used to the city and the jet lag. The next morning, we woke up very early on and started the day with a nice hearty breakfast. 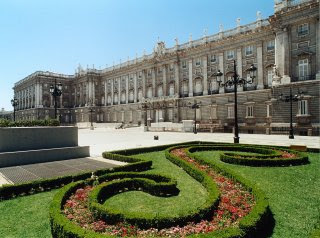 We headed to the Palacio Real, it is a major tourist attraction cause here was the residence of the King. Here we saw two incredible gardens: the Del Moro and the Sabattini. It doesn’t compare with the ones in Versailles, but they are really ones to look up to. Another thing that is a major thing in this Palacio (the Spanish word for Palace) is that it holds originals by major painters like Caravaggio, El Greco, Goya and others.